Writing symphonies is a daunting task for any living composer, as it means walking in the shadows of the giants of music’s past. 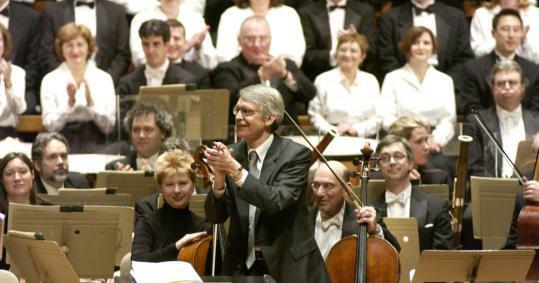 John Harbison has composed five symphonies, and over the course of this season and next, the Boston Symphony Orchestra will perform a complete Harbison symphony cycle. The BSO has also commissioned the composer to write a sixth symphony, which he has just begun. On the eve of the first installment of the BSO’s survey, Harbison spoke with the Globe about his perspective on this imposing genre, about the inspiration he drew from earlier models, and about the creative block he first experienced — until his unconscious stepped up to save the day. Q. It’s sometimes said that the genre of the symphony, like the great realist novel, culminated in the 19th century. How did you initially approach the idea of the symphony today? A. I thought a lot about Mahler and Sibelius. What Mahler seemed to be doing was writing this kind of autobiography, trying to tell everybody his own story, to create a world. Sibelius seemed to be thinking in a very different way, and for a while it was even more interesting to me. He was thinking about how musical thought proceeds, and how ideas do and don’t get carried off. There’s something rather private about Sibelius. Even though the sound can be quite grand, you learn very little about Sibelius himself. It seemed to me at the time that both of these ideals of symphonic expression were available, in those extreme forms, to be pushed on with. Q. Did you think much about that other strain of modern symphonic expression, in which the composer turned outward, self-consciously trying to convey a grand public mythology? Q. When a composer prepares to write a first symphony, it must still be difficult to bracket all of that history. In your case, your Symphony No. 1 was actually prompted by a dream of someone else’s music? A. Yes, that symphony was the hardest to begin, for all of these reasons, until this dream. I dream about music quite a lot, but this was one of the few cases when I could remember all of the harmonies. I was really able to transcribe them out of the dream, and I know they came from the dream because they were not harmonies I had been thinking about in my waking hours. And the weirdest trick was that in the dream, it was not my music, it was by a friend of mine, Peter Maxwell Davies, who was conducting his own score. When I woke up and realized that it wasn’t really [Davies’s] music, since it was my dream, there was a feeling of great relief. I thought ‘‘hell, I can use this!’’ The piece doesn’t actually sound anything like his music. Q. Meanwhile, the BSO is actually beginning its survey not with your First but with your Third Symphony. A. I’ve been told that the Third Symphony is the most balanced of the group. It seems like there is some sort of healthy middle, almost in an 18th-century sense of equilibrium. I think that was in reaction to my earlier symphonies. The Second succumbs to such a depression that I got calls from people asking, ‘‘Are you all right, are you in the hospital?’’ That piece did spiral downward and I couldn’t get it back. And in the First Symphony, I was trying to respond to my public responsibility of writing a ‘‘first symphony.’’ I wanted it to end in a clear and orderly affirmation, so it does conclude with a movement that is kind of Haydn-esque, in that a small amount of material is given the illusion that it’s wrapped up in some kind of satisfying way. The Third Symphony by contrast tried to see if the characters could add up to that mythical middle we’re all supposed to reach after years of yoga, or psychiatry, or running. Q. You have written that you intended the Third Symphony’s final movement to have a certain ‘‘healthy and positive’’ energy, but that the piece itself did not permit this. How do you approach this larger tension between retaining agency as a composer and affording the musical material an integrity of its own? A. I think the listener hopes that the composer is in pretty good control over what’s happening, but it’s seldom really the case. I always tell my students that if you’re writing a program note about one of your pieces, give the impression that you at least sort of knew what you were doing! But I also think that that’s where the most interest comes, in pieces by all kinds of composers where some shadow creeps in or some exaltation takes over. It’s almost as if something overrules the composer’s best guess. I find that really fascinating, and it’s what leads to some details you’ve never heard that composer try before. Even in some incredibly well-organized piece by Bach, every once in a while, there will be these startlingly unique moves that you’ve never experienced him do before. . . . I’ve always felt that’s something that composers have to remember, to leave space open for that to happen. Q. Is there anything to say at this point about your in-progress Sixth Symphony? A. I have one page of a really good sketch, and you know, as long as there’s even a shard that looks promising, it’s possible to feel confident. The optimistic feeling I have is that at least I’m not at zero. This time I’m not sitting around, waiting for a dream. Interview has been edited and condensed. JAMES LEVINE and the BSO perform the first program in a two-season survey of John Harbison’s symphonies. Harbison’s Third will be paired with Mahler’s Fifth Symphony. Oct. 14-16, Symphony Hall, 617-266-1200 or www.bso.org.